The prognosis, it’s not good. Back in 2008, on New Year’s Day, I was the one who found her on the floor of the bathroom, a massive stroke claiming her body as she lay there helpless and scared. As I held her in my arms and heard the distant wail of the sirens growing increasingly louder, I sang our favorite song, convinced she would die at any moment, holding my breath as I waited for help to arrive. But my grandmother, she had other plans. Though not the same woman entirely after that fateful day, my grandmother’s trademark strength and stubbornness defied the doctors’ predictions and we watched with grateful hearts as she began to recover, a slow and painful journey often marked by small achievements and glaring setbacks. On good days, my devout Catholic grandmother would tell dirty jokes and pretend she didn’t like it when we smothered her with kisses. On bad days, she would wonder where she was, confused and agitated, convinced we were trying to get rid of her. For five and a half years the pendulum has swung between these two extremes, and in the middle was where we strived to reside, a place where my grandmother was happy, content, and complaining that she wasn’t getting enough dessert with her meals. Two weeks ago she went into the hospital for gallbladder surgery. She was in pain and even though it was a risky procedure, it had to be done. They discovered in the ER that she had walking pneumonia, but the surgery couldn’t be postponed, and after being intubated, the quiet infection which had previously gone unnoticed began to rage inside her frail body and she was admitted into the ICU. I’ve witnessed many injuries and ailments and illnesses over the years. I’ve seen loved ones doubled over in pain and I’ve seen my special needs son suffer through rare infections and so many seizures I eventually lost count. But I was not prepared to see someone I loved struggle to take a breath. Out of all the ways to suffer in this world, not being able to breathe……….is nothing short of torture. She was released from the hospital late last week. “Nothing more we can do for her,” they said. She’s in a rehabilitative nursing home now, her days spent in a white room with a pretty view of the courtyard. In her lucid moments she calls out my name while I sit next to her, her hand gripping mine with that stubborn strength that’s seen her through war and death and unfairness and more anguish than any one person should ever have to face. It courses through her shrinking body until it reaches my palm and my fingers and I soak it up and hope it sinks in because if I even have a fraction of her resilience and determination during my lifetime I will consider myself blessed and lucky indeed. That same hand used to patiently wrap itself around mine when I was a child and frightened of the dark, consumed by the obsessions and compulsions that plagued me, convinced my nightmares would become reality as soon as the lights were out and the house succumbed to slumber. We shared a bedroom for years in our small apartment, my immigrant parents too busy putting food on the table to concern themselves with such luxuries as enough bedrooms for everyone; I sometimes acted annoyed at the lack of privacy, but each night, as darkness fell, I reached for that hand, and each night, no matter how exhausted she was, my grandmother reached across our two twin beds, and held my hand in hers until I fell asleep. Now it’s my turn to hold hers. I don’t know what to say, so instead I hold her hand and bury my head in her chest, hoping my body does not betray me and reveal my silent sobs. If that’s supposed to dilute my grief, it’s failing miserably. And I don’t want to hear it. From anyone. It’s devastating to see someone you love so fiercely suffer. It’s almost impossible to bear knowing that life keeps going, even though you believe it should stop in its tracks when something like this happens. When she moans from pain and calls out my name or when she summons her beloved Jesus, I am simultaneously humbled and terrified, reminded of my own mortality, and that inevitably the same fate awaits me, though the details of my own demise will likely differ. And last I heard, when it comes to mortality, there’s not a damn thing I or anyone else can do to avoid it. So instead, I spend a part of each day sitting at her bedside, doing the only thing I know how, the one thing she did for me all those years ago when I was a frightened, helpless child, convinced the darkness would swallow me up and never let me near the light again. My grandmother, her name is Valeria. It means brave and strong and valiant and she is all of these things and more. She is also a woman of profound faith, and I know she would appreciate your prayers and positive thoughts. ← I Drove Drunk Again. 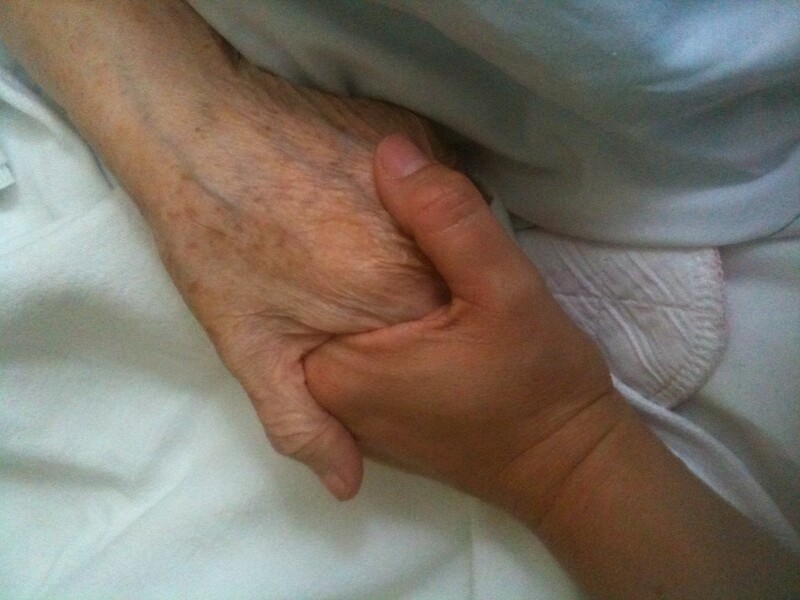 I will be praying for your sweet grandma, I know this desperate feeling of being powerless. I lost my grandma this year, as I write this my eyes are teary, she too went for a gallbladder surgery, and they realized something else wasn’t right. After many tests she was diagnosed with ovarian cancer. We didn’t want to think she wasn’t going to make it, we prayed and prayed for whatever glimpse of hope. I could not go to see her, my heart still aches because I couldn’t hold her hand and kiss her. My mom said she was always asking for kisses. 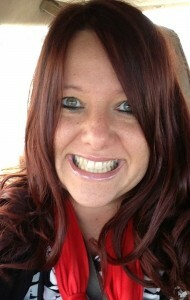 She was full of life, she was the one who loved me regardless, even when I made mistakes. Think positive and love your sweet grandma. Lots of prayers coming your way. It wasn’t so long ago that I went through the same thing with my grandparents and then parents. It seems like a lifetime. I will be praying for both you and your dear grandmother. know that we will be praying. stay brave. stay strong. be valiant for as she was for you all those years. blessings and grace Jo. you are not alone. The bond between you and your grandmother is so amazing. So beautiful. I have no doubt that she is, with every gentle clasping of your hands together, imbuing you with her strength and resilience. It’s already evident in what you have already overcome and the fierceness of your love for your family and friends. Sending love and prayers across the miles. There are times in life when there are no words. 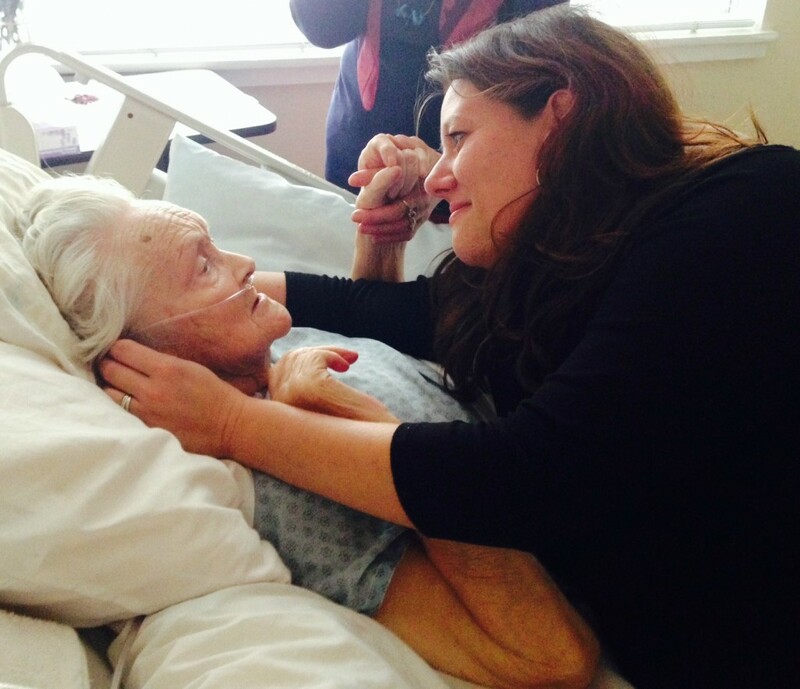 Being present with a loved one during their final days is one of those times. The pain and grief are unbearable at times. Having walked this path with my mother, 9 months ago, I understand your pain. There will be days when you think you can no longer bear it. However, you will. You are your grandmothers granddaughter. 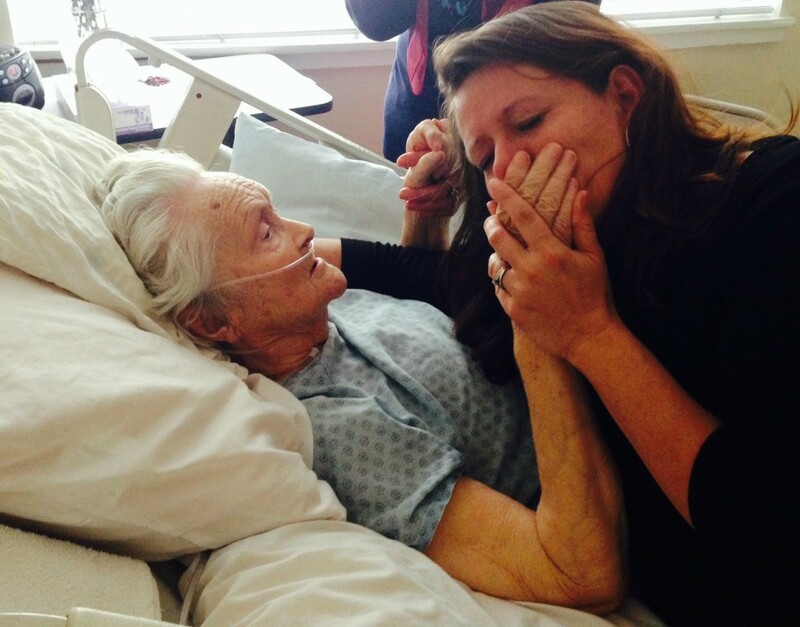 You will somehow, someway find the strength to do what needs to be done for your grandmother. Her strength, resilience and compassion lives in you and will continue to live on through you. The circle of life is bittersweet. The beginning is beautiful, the ending is not really an ending but a new beginning, for your grandmother. God’s work for her here on earth is coming to an end, her beautiful soul is needed elsewhere. Be gentle with yourself during this transition time. Feel your feelings. It’s okay to be sad, angry or whatever it is you are feeling. This time in your life is one of the most difficult and there are no rules, no manual to help you through. Please share with your grandmother, my mother’s experience, if you think it will help. She too was scared, and did not want to be alone at the end. I sat with her, laid next to her on her bed, held her and just listened when she felt like talking. She said she needed to get to the canoe, couldn’t I see the canoe and all the people waiting for her? She needed to get there. I told her that no, I couldn’t see it, and I couldn’t help her get there, but when she was ready and got there, it was okay to go. We (my son and I) would be okay, that we loved her, I thanked her for being my mom and all she had taught me. Praying for peace, strength and grace during this time for your grandmother, you and your family. Sending love and prayers to your beautiful grandmother, Jo. Jo, praying for your Grandmother, you and your sister and all your family. So glad you are able to spend time with her every day and return the favor of hand holding. I am sure it is a great comfort to her. I can’t stop crying. This is beautiful and heartbreaking. I am praying for your grandmother, for you, for your entire family. You expressed this so beautifully and achingly, I just hurt for you. What an absolutely beautiful tribute to a woman who sounds just as beautiful on the inside as she looks on the oustide. I will be praying for you both. God bless you! Jo, you expressed this so amazingly. I am so sorry that you and your family have to endure this. One of the most gut-wrenching but beautiful moments of my life was helping my grandpa transition from this life to the next. I am so very grateful to have had the privilege of helping him when he had helped me so much over the course of my life. Prayers and good thoughts to you, your grandmother, and the rest of your family. Pingback: Sometimes He’ll Need a Hug. And Sometimes He’ll Need a Hammer.